> EARTH HOUR @ MOA STARTS @ 6:00 P.M. COME ONE COME ALL! EARTH HOUR @ MOA STARTS @ 6:00 P.M. COME ONE COME ALL! The main switch-off event will begin at 6PM on 26 March at the SM Mall of Asia Globe area. The event also serves as a kick-off for a planned year-long WWF climate change solutions campaign. Still, thousands of Filipino towns, cities and landmarks are expected to join the switch-off. Filipinos from 1,041 cities and towns will join the world in spending Earth Hour and environmental group World Wide Fund for Nature (WWF) Philippines listed 10 ways to do as Filipinos turn off the lights from 8:30 p.m. to 9:30 p.m. Saturday. 2. Host an outdoor evening party with friends and family. Fire up the flashlights or candles, dine on organic food and talk about ways to reduce energy use. 3. Encourage kids to unplug their electronic gadgets to play and explore the outdoors. Play traditional Filipino games like “patintero” or spend the afternoon birdwatching. 4. Do a recyclables’ hunt. Get your flashlights and find cans, bottles and boxes that can be reused to reduce items that end up in landfills. A fun tip: reuse plastic grocery bags. 5. Green that workspace! Aside from turning off the office lights, make sure to unplug computer screens and speakers instead of leaving them on overnight. Shutting the screen and speakers down when unused can lower power consumption and electricity bills drastically. 6. Involve local leaders to set up a community "green" discussion in a public building from on March 27. Help organize attendance and ask your leaders of their plans to make your area greener. 7. Clean up your street. Grab a flashlight and walk down your house street, picking up trash and recyclables as you go. It's a great chance to do some stargazing too! 8. Unplug electrics and just chill out. Turn off the screens, shut your cell phones and just have an hour of steady time with your family. 9. Give yourself an energy makeover. Use Earth Hour as a reason to make your home more energy efficient: Replace old incandescent bulbs with energy-saver, more efficient CFL bulbs. Install power strips to turn computers and electronics on and off more easily, since appliances on standby mode consume up to 30 percent of energy. 10. Make a pledge for the planet and take a first step toward lowering your overall impact on the environment after Earth Hour. Recycle, take public transportation, unplug electronics when not in use, and spread the need to reduce our carbon footprint. 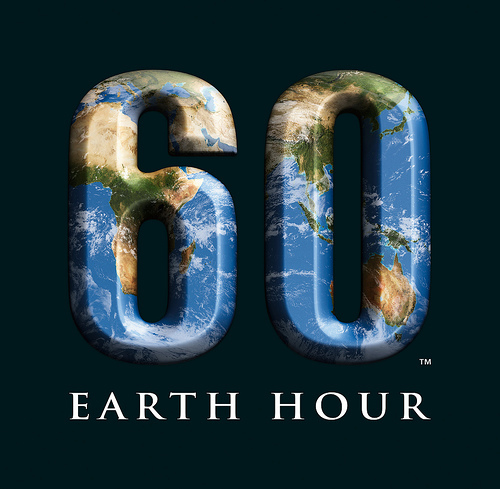 Earth Hour shouldn't end at 9:31p.m. when we turn the lights on again. It's a step towards making a personal pledge to be more environment-friendly. You’ll hit two birds with one stone by saving on both cash and carbon emissions.